One cat year does not equal seven human years. 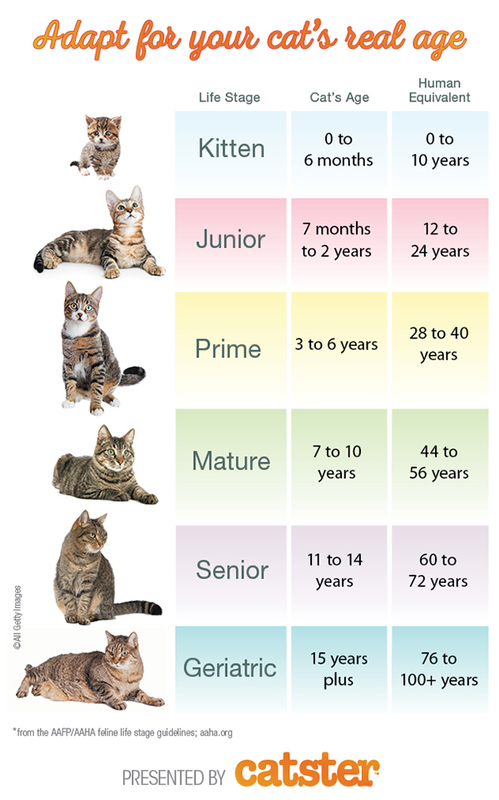 Read on for tips on determining your cat’s age and check out a helpful cat years to human years chart. A popular misconception is that cats age seven years (in human years) for each calendar year. In fact, feline aging is much more rapid during the first two years of life. A cat reaches the approximate human age of 15 during his first year, then 24 at age 2. Each year thereafter, a cat ages approximately four cat years for every calendar year. Thus, a cat who is 5 in cat years would be approximately 36 in human years. Note: It should be remembered that a cat who lives outdoors ages far more quickly, perhaps even twice as fast, than an indoor cat. Scroll to the bottom of this article to find out more about cat years to human years for outdoor cats. 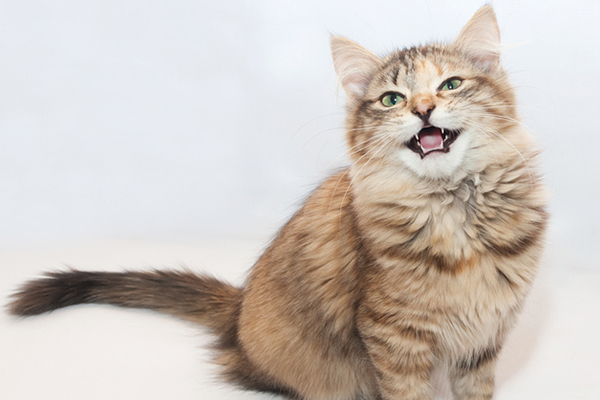 A cat’s teeth can indicate a cat’s age in cat years. Photography ©Seiichi Tanaka | iStock / Getty Images Plus. 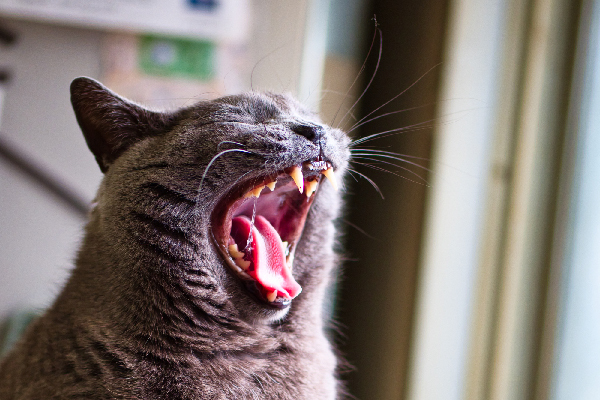 A Cat’s Teeth: Teeth are a great indicator of a cat’s age in cat years. Older cats tend to have more staining than younger cats, assuming the previous owner was negligent in brushing the cat’s teeth. And a kitten’s teeth first come in between two to four weeks; their more permanent set appears at around four months of age. So if you open a cat’s mouth and find permanent, white teeth, the feline is likely to be around a year old. Some yellowing might place the cat between 1 and 2, and tartar build-up on all the teeth indicates that the cat could be between 3 and 5. Missing teeth may mean you have a senior cat on your hands. A Cat’s Muscle Tone: Younger cats are more likely to have some muscle definition from their higher activity level. 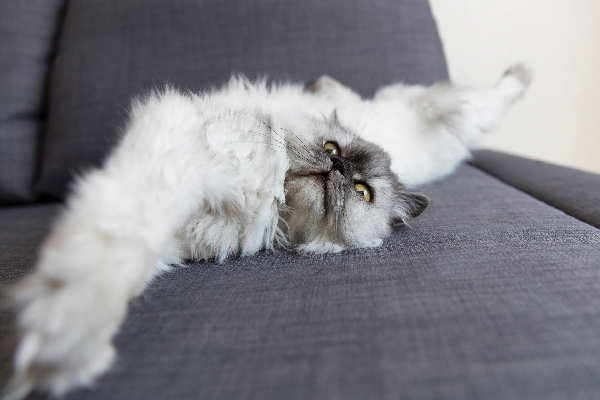 Older cats are usually a bit bonier and may have some extra skin hanging or protruding shoulder blades. A Cat’s Coat: The condition of a cat’s coat is another great indicator of a kitty’s age in cat years. Kittens and younger cats usually have soft, fine coats, whereas older cats tends to have thicker, coarser fur. A senior cat may display grays or patches of white. 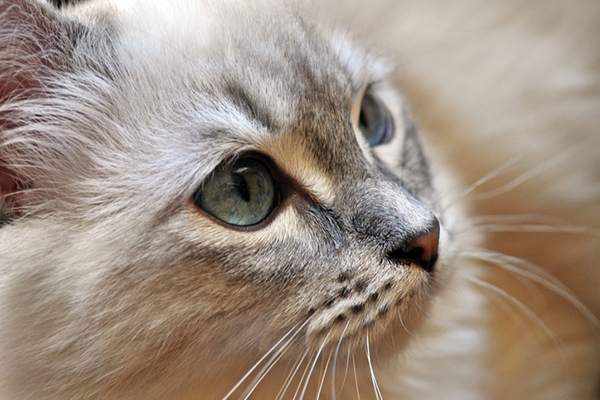 A Cat’s Eyes: Bright, clear eyes without tearing or eye discharge are common in younger cats. A cat with some cloudiness in their eyes is likely to be 12 years old or so. While inspecting the lens, also examine the iris of the eye. Young cats have smooth irises, while the iris of an old cat can sometimes appear somewhat jagged. Felines are generally quite long-lived, though mileage varies depending on owner maintenance and genetic predisposition. In a handful of documented cases, cats have exceeded 30 years in age. Typically, indoor cats may live 12 to 18 years, with many surviving into their 20s. Outdoor Cats Life Expectancy — How Long Do Outdoor Cats Live, in Cat Years? Outdoor cats can have a significantly shorter life expectancy then indoor-only cats, often living only two to five years. 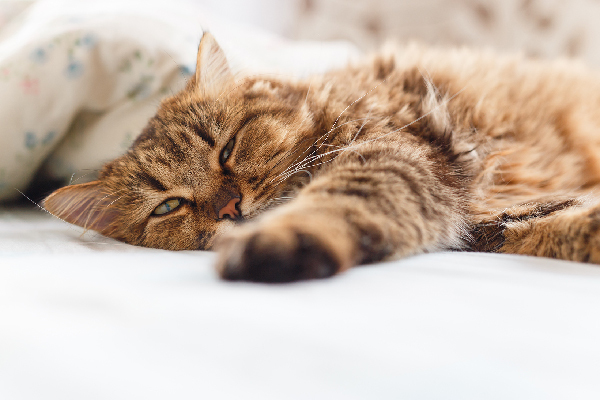 Pet parents in urban and suburban areas are strongly encouraged to keep their cats indoors. Tell us: How old is your cat in cat years? How old is your cat in human years? Thumbnail: Photography © Indiah | Thinkstock. Yes I have a 6 year old and a 8 month old pixie Bob’s and they are wonderful cats.My son got me a beautiful male pix I Bob for my birthday his the oldest of the two an he loves to talk an play. For my 8 month old pixie bob she more prissy . They both are wonderful cats . M y cats don’t like strangers. I have been blessed with these two. My male is the father to my girl an they are so much alot. You would have thought he gave birth to her. one is nearly sixteen but now has hyperthyroidism. Its been a new experience having them live this long. All were very healthy til fourteen or fifteen. Great page. Why isn’t this called a Catculator ? ???? Where’s the chart that I used to love and use religiously? I just had to have my beautiful Calico of 14 yrs 7 months put to sleep. She was not doing well due to unregulated Diabetes and most likely Pancreatitis. She fought hard for 7 long months but I figured she needed to be free rather than keep sticking her with needles or adding more meds (that she would not take anyway). I will miss her dearly. So almost 15 so close to 76 or more. My three cats are a 3 yr old Bengal, a 13 yr old Devon Rex and a 23 yr old tuxedo cat. All are doing very well! Holy crap, our oldest cat Ginger is over 120years old!! He’s diabetic and on painkillers, but he could still win any beauty contest in my eyes. Wow, what an interesting article, thank you! Our guy was born on our property in August 2002. He is feral, even though we have tried mightily to coax him in. He was 1 of 4 kittens. We kept him because he was so timid and we feared for him. His wonderful mother was feral as well and she taught him, painfully, that we were not to be trusted. Oh, it was okay if she was petted, and crooned over , but he had to keep his distance! She died 3 years ago. She might have been 15. Since he needed help staying warm we took the straw out of their sleep box and put in a heated pad with wool and fleece blankets. outside the door which had heavy plastic strips we put straw for cooler sleeping. He eats well, both wet and dry food, he likes courses. and drinks warm water in cold weather. Still plays, comes when called, and hears well. Our son installed a cat cam and watching him yesterday I called him and instantly his head popped up and he came to the deck. The cat cam is so comforting as we can keep an eye on him. 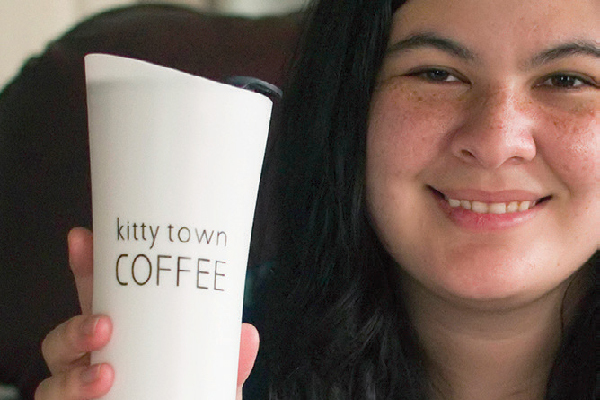 Love the website, there are so many cat lovers! I have read that cats can’t control their body temperature well, and it isn’t recommended to put a heating pad in their bed or wherever they sleep. Straw is preferred as it works well with moisture. If you want to make an outdoor house for feral cats, there is an inexpensive way to do it- just Google it and it shows you all the steps and what you need. Sounds as though he isn’t totally feral if he comes when called. You just may be surprised one day when he decides to come in and be an indoor cat! Thank you for taking care of him!! Hi. We had 2 feral cats many years ago. I put food under bush for them, and moved it nearer to door every day. Eventually got them to eat inside door, and then kitchen. I would lay on hall floor to b at their height, and put my hand out to them. It took about 6 months, but did come in. After all my effort, they would sit on my husbands lap! Lol. One went off after 18months. The other stayed for 7 years, but think he got killrd on road. Then, surprise, the other cat came back! We only had him for 6 months before he died on road. 10 years ago, a brother and sister cat moved in with us from next door. (they had a cruel boy) we lost the male 3 months ago, and female has to have special diet because she has kidney probs. They both very loving. He loved his garden and is now buried under apple tree. Amen, you are blessed. Hope you have lots more time with your best friends. My 21 year old tuxedo male is showing his age but still going strong,..losing it mentally & physically a tad but if a human was over 100 years old, it seems to be the same. The way I calculate a cats age is this… If your cat can outlive your marriage then it wins! I agree, this age calculation is not realistic! My one cat is 17 and the other is 18. They are both very healthy, lively cats. People are shocked when I tell them their ages. The 17 year old still loves to play and climb trees. My cat is 17 years old. She is getting quite frail. But she still eats and drinks. She will even play some sometimes. She is all black with a smidgen of white on her chest. Her name is Licorice. She comes when she is called. I am doing my best to keep her well. I want her to be with me always. I love Licorice so much. ???? I think that by “outdoor” cat they mean ferile cats where, in addition to uncertain nutrition and illness and injury from fights, there is the major hazard of cars. A cat that spends most of her/her time outdoors but is looked after and can come indoors to warmth and food when needed is not an “outdoor” cat. A cat that is allowed to range outdoors faces the same hazards as a feral cat does. The only difference is they know where they can always get food and they have access to veterinary care. My one male cat died at the ripe old age of 100, or 176, depending on how you add it up. He lived inside our home, but was let outside a lot. Probably take the average between the two. Also, here’s the rest of the ages, by human, indoor cat, and outdoor cat. My Hoppitty (indoor calico) died a week ago but she lived in human years, 28 years and 94 days. I gave her loving every time I came into the room, petting and brushing everyday as much as she wanted. As for brushing I couldn’t tell you how many times I got bit. Hoppitty was fed 4 times a day, wet cat food along with Shade is (about 19 according to my vet) now. Shade started off feral when I was peparing a screen she slipped into the room. After 2 months she started to come around and now she is a lover. The main thing is, vet checkups and spay or nuetring help your cats more often then not to live a long life.